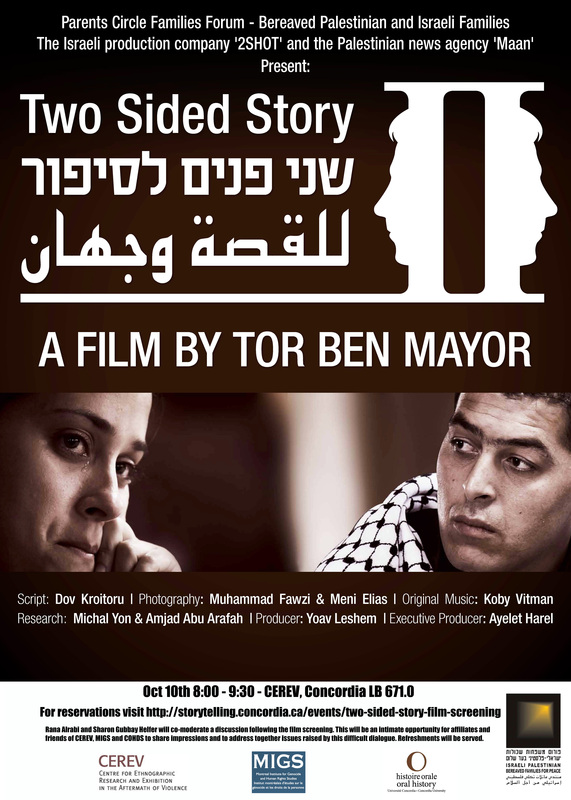 “In the film, Emmy award director, Tor Ben Mayor follows a group of 27 Palestinians and Israelis who meet under the frame of a unique project called “History through the Human Eye” led by Parents Circle-Families Forum – bereaved Palestinian and Israelis for Peace and Reconciliation. The project’s goal is to acknowledge the narrative of the other. Together they create the conflict mosaic. Among them include Bereaved families, Orthodox Jews and religious Muslims, settlers, ex soldiers in the Israeli army, ex security prisoners, citizens of the Gaza strip, kibbutz members, second generation holocaust survivors, non violent activists and more. Each and every one holds his own historical truth, and carries with him his own emotional baggage. Visit the website for more details on the film. Please join us for this intimate opportunity for affiliates and friends of CEREV, MIGS and COHDS to share impressions and to address together issues raised by this difficult dialogue. Refreshments will be served.